In celebrating 90 amazing years of Disney's Mickey Mouse, Beast Kingdom is proud to present the latest diorama range from D-Stage! The 1940 animated classic Fantasia, is a dreamlike masterpiece, which perfectly fuses classical music with beautifully envisioned hand-drawn animation. In Fantasia's beloved "Sorcerer's Apprentice" scene the star apprentice causes mayhem with his rudimentary magical skills. 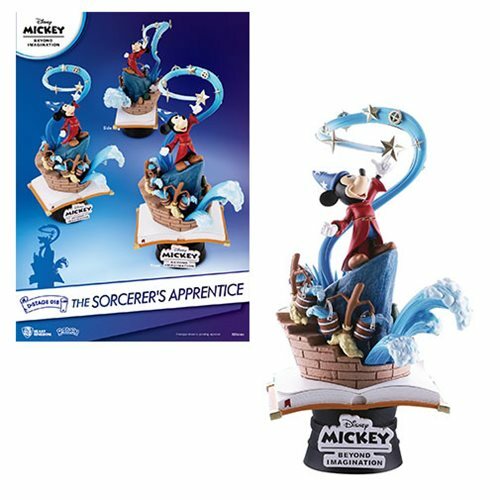 The D-Stage 018: The Sorcerer's Apprentice offers this beautifully envisioned world of Mickey Mouse as the Sorcerer's Apprentice. By mimicking the story's sprawling imagery of magical brooms and starry nights, the sculpture is finished with exquisite detail and richly layered colors, allowing collectors to keep one of the finest moments of the animation in one snapshot.